INTERNATIONAL TELEMETERING CONFERENCE (ITC), GLENDALE, Ariz. (Booth #101) – November 6, 2018 – Curtiss-Wright’s Defense Solutions division today announced that its Aerospace Instrumentation (AI) business unit will present a live demonstration of a fully integrated next generation system-level flight test instrumentation (FTI) solution using current data acquisition technology in their booth (#101) at the 2018 ITC Conference. The “Networked from Ground to Air” demo features Curtiss-Wright’s industry-leading airborne data acquisition system (DAS), one of the most extensive, flexible, and widely installed FTI product families in the world. Supporting emerging new standards with a Chapter 7 and iNET components, the high-speed Ethernet-based architecture enables line-of-sight communications to enable flight test engineers to reconfigure test articles during mission. For example, the data recorder, camera sources, parameters and image downlink bit-rates can be modified remotely. The demo showcases Curtiss-Wright’s latest hardware, including high speed DAUs, switches and recorders, and rugged IP cameras and multi-mode transceivers. 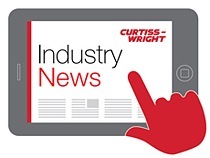 The demonstration also highlights Curtiss-Wright’s ability to serve as a one-stop FTI system solution provider, with its ability to provide customers with the full range of interoperable DAS system products. The demo shows how Curtiss-Wright’s Commercial Off-The-Shelf (COTS) approach to FTI system integration is ideal for meeting the design challenges unique to flight test programs, easing the adoption of modern Ethernet networks, remote nodes and wireless topologies that make system installation simpler and quicker. For flight test engineers, one of the most daunting challenges is defining an FTI system that can be developed and installed quickly, can collect data reliably on every single test flight, and also provides the level of modularity and flexibility needed to easily adapt to evolving requirements, both during and after the development cycle. This COTS FTI approach speeds the integration of test applications while lowering program costs and schedule risks. Combines CH7 and CH4 data for maximum bitrate efficiency when combing asynchronous and synchronous data. Axon DAU systems are easy to integrate and expand. Multiple Axon modules can be integrated into a single Axon chassis. The Axon chassis, Axon user modules, and Axonite remote housing are designed to work with Curtiss-Wright’s TTC DAU and KAM-500 DAU family of products, including high-speed cameras, data recorders, and switches. Axon DAUs provide the most powerful and modern solution on the market by combining unprecedented flexibility with outstanding reliability for demanding applications. Axon modules and chassis, now available in 6, 9, and 16-slot configurations, enable FTI engineers to quickly configure and deploy the vast amounts of data acquisition required to support demanding flight test, missile test, and space developmental/operation flight instrumentation programs. Ideal for use in flight test, system monitoring, power system upgrades, or life extension programs. In 2017, Curtiss-Wright integrated its Dublin business unit (Ireland) with the Teletronics Technology Corporation business unit (based in Newtown, Pennsylvania), to form the Industry’s broadest and most experienced single source for customers of commercial and defense aerospace instrumentation system solutions. With the merger of the two business units, Curtiss-Wright now supports more aerospace flight test customers, platforms, and programs than any other competitor around the world. What’s more, with its increased resources and global reach, the Company is able to significantly expand the availability of its unmatched quality and customer support, while bringing even larger system-level solutions to market. Sales inquiries: Please forward all Sales and reader service inquiries to ds@curtisswright.com. For more information about the Curtiss-Wrights Defense Solutions division, please visit www.curtisswrightds.com.